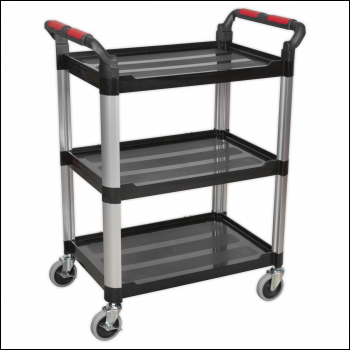 Composite garage workshop trolley with a 40kg capacity per shelf. Walls on only three sides of each shelf allow easy access when adding or removing items. Four large castors, two locking. May also be used as a janitorial trolley. Composite garage workshop trolley with a 40kg capacity per shelf. Walls on only three sides of each shelf allow easy access when adding or removing items. May also be used as a janitorial trolley. Overall Size (W x D x H): 750 x 460 x 980mm.